The formation of complex multicellular bacterial communities known as biofilms is critical for virulence, environmental persistence, or genetic exchange in microbial pathogens. Thus, understanding the mechanisms underlying biofilm formation may uncover novel approaches to combat diverse clinically relevant infections. 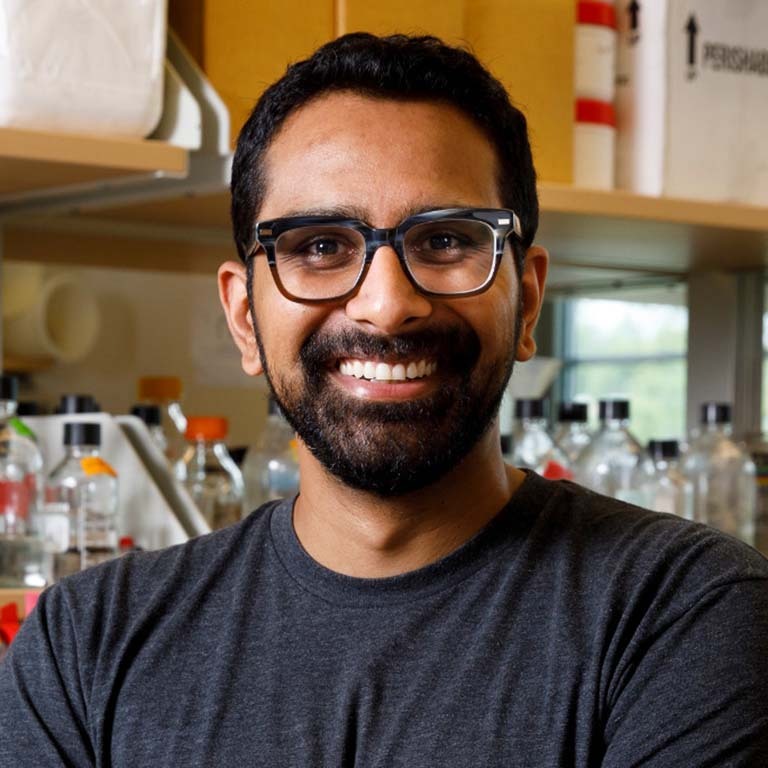 Ankur Dalia, an assistant professor in the Department of Biology, and his lab study the basic biology and mechanisms of biofilms using Vibrio cholerae as a model system. This bacterium is the causative agent of the diarrheal disease cholera; however, rather than studying the virulence of the pathogen, Dalia and researchers in his lab will leverage this well-established model system and the genetic tools they have developed to characterize biofilms in a physiologically relevant context. V. cholerae forms biofilms in its aquatic reservoir on the chitinous shells of crustacean zooplankton. Chitin biofilms play three important roles in the ecology of this organism. First, V. cholerae degrades chitin into soluble oligosaccharides, which serve as an important carbon and nitrogen source in the aquatic environment. Second, growth in chitin biofilms induces natural transformation, a conserved mechanism of horizontal gene transfer that can promote the acquisition of antibiotic resistance genes and novel virulence factors. Third, chitin biofilms are important for the waterborne transmission of cholera. Following ingestion of a chitin biofilm, V. cholerae must rapidly alter its metabolism from growth on chitin to competing with the intestinal microbiota for the carbon sources available within its infected host. "Our model system provides a unique opportunity to characterize how cells within a bacterial community utilize the biotic surface of chitin for biofilm formation, as a nutrient source, a platform for genetic exchange, and transmission," says Dalia. "These studies may inform novel strategies to combat clinically relevant infections and stem the spread of antibiotic resistance and virulence in diverse bacterial pathogens." Dalia was awarded $1,894,717 earlier this year for his grant application titled “Characterizing the basic biology and mechanisms of biofilms in Vibrio cholerae” through a Maximizing Investigators' Research Award for Early Stage Investigators (R35). The MIRA, as the award is known, is presented by the National Institute of General Medical Sciences, a section of the National Institutes of Health. It provides support for an investigator's research that falls within the mission of NIGMS. The MIRA provides researchers with greater stability and flexibility which in turn enhances scientific productivity and the chances for important breakthroughs. The award is for five years. Dalia aims to define the mechanisms of initial adherence to chitin, DNA uptake and integration during natural transformation, and metabolism during growth in chitin biofilms and in the mammalian host following transmission. He and his lab have generated a number of tools to address these questions. Namely, they use a novel method to fluorescently label pili, which are surface appendages required for initial attachment to chitin and for DNA uptake during natural transformation. Using this new method, they can observe the dynamic nature of these pili. This is not possible by any other approach and should allow them to address their role in chitin biofilms. Pili are broadly conserved, and the Dalia lab's studies will address fundamental and long-standing questions about these structures that should be applicable to many bacterial pathogens. They have also recently improved a method for multiplex genome editing by natural transformation (MuGENT), which can be used to dissect complex biological questions where genetic redundancy poses an issue. In preliminary data, they demonstrate that this tool is well poised to dissect the metabolism of V. cholerae in chitin biofilms and in the mammalian host. The innovative approaches proposed will provide a paradigm for the study of critical and conserved processes (i.e., adherence, biofilm formation, natural transformation, and metabolism) in diverse microbial species.